Matt Fitzpatrick slipped three shots off the lead at the Dubai Desert Classic after slow progress on day two. The Sheffield golfer – who began the day as the solo leader – was hit with by a double bogey five on the seventh hole and struggled to make real inroads on a good day of scoring for the field. As he did in his first round, the 25-year-old finished strongly with three birdies from the last six holes to ensure he will begin day three in a tie for tenth place. 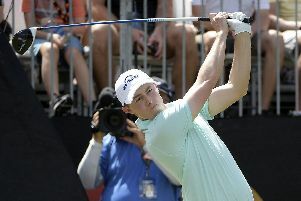 While his two under par round of 70 was enough to keep him in contention, it was a case of what might have been as plenty of other players surged into contention. Australia’s Lucas Herbert carded a nine under par 63 to take a share of the lead on -12 with world number five Bryson Dechambeau, who was six under for the day. Spain’s Alvaro Quiros (-8) and veteran Ernie Els (-7) both enjoyed strong days to take the tie for third place on -11. Fitzpatrick’s third round is due to start at 8.05am on Saturday.